The standard deviation is a measure of dispersion of a data set around its mean. 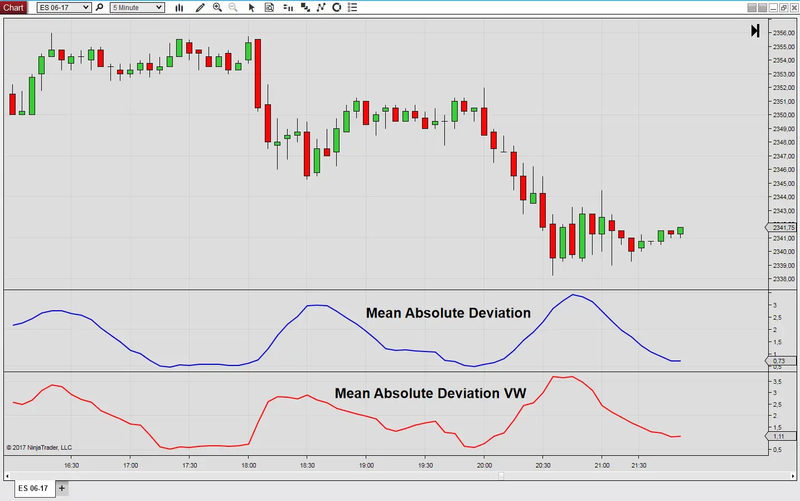 This indicator uses a similar formula as the standard deviation indicator that comes with the default installation of NinjaTrader. However, all data points are volume weighted. Volume Weighted Standard Deviation is calculated from price data over the selected lookback period. We start with the calculation of the arithmetic mean of the input data. Then we find out how much the data points deviate from the arithmetic mean and calculate the squared differences. Next we calculate the variance as the volume weighted arithmetic mean of the squared differences. Finally the standard deviation is obtained as the square root of the variance. The indicator calculates the uncorrected standard deviation from the volume weighted sample.